When I pitch this book, I often say that it’s zombies and angels and a murder mystery and a maybe extinct (or maybe not extinct) woodpecker. And it is all of those things, and so much more. Synopsis (Goodreads): Just when seventeen-year-old Cullen Witter thinks he understands everything about his small and painfully dull Arkansas town, it all disappears. . . . In the summer before Cullen’s senior year, a nominally-depressed birdwatcher named John Barling thinks he spots a species of woodpecker thought to be extinct since the 1940s in Lily, Arkansas. His rediscovery of the so-called Lazarus Woodpecker sparks a flurry of press and woodpecker-mania. Soon all the kids are getting woodpecker haircuts and everyone’s eating “Lazarus burgers.” But as absurd as the town’s carnival atmosphere has become, nothing is more startling than the realization that Cullen’s sensitive, gifted fifteen-year-old brother Gabriel has suddenly and inexplicably disappeared. Complex but truly extraordinary, tinged with melancholy and regret, comedy and absurdity, this novel finds wonder in the ordinary and emerges as ultimately hopeful. It’s about a lot more than what Cullen calls, “that damn bird.” It’s about the dream of second chances. My thoughts: I waited a long time to read this book, and in a way, I’m glad I did. Though I purchased a hardback years ago, it sat on my shelf because it never seemed to be the right time. I was looking for an audiobook I could listen to on a few trips back and forth to Kansas City and to class one weekend, and it was about the right length. The narration was really fabulous, and I found it very easy to keep ahold of both Cullen’s story and the alternating chapters that begin with Benton Sage’s mission trip. I was always excited to get back in the car, and anxious to find out how the two stories would eventually converge. 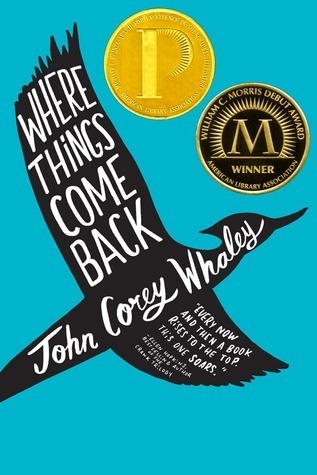 My favorite aspect of this novel is how John Corey Whaley perfectly captures boring and tedious life in a small town and how a seventeen-year-old boy would cope with that. Lily, Arkansas is a small town. A small town in which even those who might leave for a year or two after high school graduation often eventually return home. I grew up in such a town. I can still name (in alphabetical order) the 53 students of my graduating class. And many of them are married to each other (or other small towners a grade or two older than them) and still live in that same small town. And there is nothing wrong with that. As desperate as I was to escape, I don’t regret my small town upbringing. But I often feel like media representations of small town life either overly idealize it or demonize it, and both characterizations are false. Lily felt real. So, the point of my whole digression was that the setting resonated with me. It rang true. As longtime readers of my reviews will note, “place” is very important to me, and this is a novel that really uses setting to its advantage. But the characters are so great, too. Cullen is such a teenage guy. His voice is impeccable. It’s authentic and genuine without any hint of artifice or irony. Even though he’s very upset about his missing brother (and the attention a missing and maybe found woodpecker is getting while is brother has disappeared without a trace) he also has to deal with regular, everyday stuff, like a job at a convenience store and a girl who he’s idolized showing interest in him. I just felt like I knew Cullen, that he was real and not imaginary. An interesting note on the writing: Cullen’s sections are written in the first person generally, but the character often relates stories that happened to him in the third person. “When one is…” and so-forth. I found this strategy fascinating. It completely worked for the character, and kept the narration close while still allowing for a sort of distance. It made so much sense, since Cullen is always making lists of titles for stories but not actually writing. His whole internal narration is a novel, in a way. I really liked it. And as much as I loved Cullen and how he sometimes fantasizes about zombies or that he’s talking to a giant woodpecker, I enjoyed the alternating storyline as well. It’s philosophical without trying too hard. It’s intellectual but down-to-earth. And when things finally start to come together…it just works. Basically, it’s impossible to explain exactly why one should read this novel. Just rest assured that it’s worth it. It won’t work for everyone, but readers who are patient and attentive will likely enjoy this story. At the library, we were planning on starting a teen edition of our city-wide reading program, and this was the book we had selected. It didn’t end up working out (mostly because our amazing teen librarian moved to youth services manager and the new teen librarian doesn’t start until next week) and though I hadn’t read it when we made that call, I think it’s such a great book club pick. There’s a lot to unpack and discuss, but it’s also a shorter novel and not in an intimidating or overly sad read. And there are lots of programming opportunities. It’s a great novel, with both teen appeal and crossover adult appeal. Can I tell you how excited I am for Noggin? I think I have the ARC so it just might have to be my next read. Recommended for fans of: Readers who like dual storylines woven together, like in Everybody Sees the Ants by A. S. King or Charm & Strange by Stephanie Kuehn will be intrigued by the the seemingly unrelated narrative threads in Where Things Come Back. Cullen’s voice is a more mature and less over-the-top version of an average middle-class white guy, somewhere between Will Grayson, Will Grayson and Winger. In terms of how complex and layered the plot is while still being so accessible, there’s not really anything else I’ve read that is quite like it. I loved the voice with this one. I loved reading it aloud. I loved this one. I was crazy about the sort-of Southern Gothic feel of the story. But then there was that other, completely different plot line and I was thinking “there is no way that these two stories are going to converge and make any sense” and then it DID make sense and I was very, very impressed. I also have Noggin and am really excited to try it! I bought this book two years ago after hearing wonderful things and I haven’t gotten to it yet. It’s in a pile of books I really want to read this year & I have heard amazing things about Noggin this week so I think it’s time. Thanks so much for this reminder! I’d never heard of this book before, for which I will briefly hang my head in shame. Your description really makes it sound appealing. I’m adding it to my to-read list. Thanks! So funny – I was JUST going to comment that the description of this sounded like an A.S. King novel (and I LOVE A.S. King) and then I got to the part where you compared it to Everybody Sees the Ants. I have had this one on my radar for awhile, but I tend to have issues with disappearing/kidnapped children stories, so it’s not made it to the top of the list. You make this sound worth it though! You know, it’s not your typical kidnapped/disappeared child story, and it’s such a small part of it. I wouldn’t let that turn you off. It’s not a dramatic/emotional read in that sense.